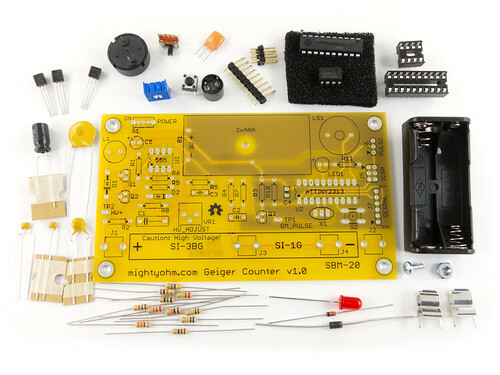 Introducing the MightyOhm Geiger Counter kit! Detect beta and gamma radiation with your own portable Geiger counter! This kit includes all components needed to build a completely open source, hackable, working Geiger counter. Most versions of the kit include a Geiger-Muller tube, but a barebones kit is also available without one (more info down below). You will need basic soldering tools and two AAA batteries to complete the kit. Don’t know how to solder? You can learn how! LED and piezo speaker alert you to detected radioactivity. Mute button for silent operation. An ATtiny2313 microcontroller brain that is begging to be hacked! You can buy a complete package that includes the Geiger Counter kit, Geiger-Muller tube, and a custom laser-cut case (recommended). 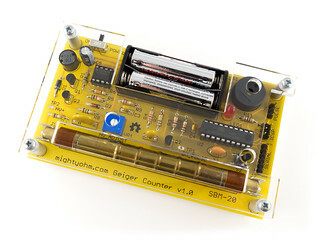 You can buy just the Geiger Counter kit with a tested, known good SBM-20 Geiger-Muller tube included. The laser-cut case is available separately. Important: Please see the Shipping Status page for information about current stock and delivery. Allow 1-2 weeks for order processing and delivery. There are now three options for international shipping: Economy, Expedited, and Express. Please take transit time and customs delays into consideration when placing your order. Note that the delivery times listed below are only a rough estimate – actual delivery times can vary significantly! Also, please check the Shipping Status page before placing an order! Economy shipping is via USPS First Class International Package. Economy shipping does not offer tracking or insurance. Delivery time is typically 4-6 weeks but can vary due to customs delays. Expedited shipping is via USPS Priority Mail International. Expedited service offers insurance up to $200 and limited tracking to participating countries. Delivery time is typically 2-3 weeks but can sometimes take longer due to customs delays. Express service offers insurance up to $200 and tracking to most countries. Delivery time is typically 1-2 weeks but can vary due to customs delays. Very important note: VAT taxes, duties, import tariffs, customs fees, etc. are the responsibility of the buyer! If you are giving a workshop and want to place a large order (at least 10 kits), please contact me for details on volume pricing and to obtain a shipping quote. 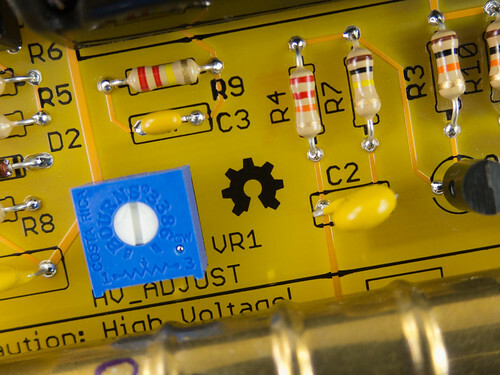 The HVPS is based on a design that I first saw at BroHogan‘s DIYGeigerCounter site. The original circuit appears in “Biassing [sic] G-M Tubes Isn’t So Hard” by Tom Napier in the January 2004 issue of Nuts & Volts.